It’s not just China; the race to build Eurasian infrastructure has many players. The 21st century version of “the Great Game” is being played out across Eurasia. This time, it is about building bridges rather than occupying territory. China’s Belt and Road Initiative is the headline act, but building infrastructure in Eurasia is not a purely Chinese-led endeavor. The connection of the supercontinent is an international effort, carried out by a variety of actors, big and small. Along with China, Japan also has an infrastructure initiative; so do Russia, India, and Turkey. Even smaller international players like Kazakhstan have their own characteristic infrastructure plans. Building railroads is clearly in vogue, and infrastructure projects are fast becoming like beer brands and national airlines – every self respecting country needs at least one. The D.C.-based Center for Strategic and International Studies’ project, “Reconnecting Asia,” bills these initiatives as “competing visions” for the continent, but how does (for example) Russia’s vision actually vie with China’s? If China and Japan bid to build a high-speed rail in Indonesia, surely they are both offering a complementary vision of connectivity? On the surface of it, helping improve trade flows and upgrading roads is good for everyone involved. That’s certainly the way Beijing spins it. They insist that the Belt and Road’s goal is to integrate the world and bring mutual, “win-win” benefit to all. Announced in 2013, the Belt and Road Initiative is an umbrella brand for an amalgam of disparate infrastructure projects across Eurasia and its maritime periphery. Any picture of the Belt and Road is necessarily blurry, but it’s indisputably big. The funding figures bandied about by official Chinese sources approach $900 billion, sometimes rounded up to, and beyond, $1 trillion. But there still seems to be plenty of room for multiple state financiers in the infrastructure business. The Asian Development Bank (ADB) prices Asia’s infrastructure needs at over $26 trillion, a staggering figure barely approached by even the wildest cumulative promises of Chinese officials. By way of contrast, the ADB itself dolled out a record high of only $27.7 billion in 2015, and the Chinese-led Asian Infrastructure Investment Bank (AIIB) has lent around $2 billion since operations began last year. But though it seems there’s more than enough room for all the players, building bridges is inevitably a competitive, political task. Japan and China may be offering essentially the same vision of connectivity, but it matters who does the connecting. Sometimes it matters strategically (who owns what port), sometimes it matters in terms of influence (who is in debt to whom), and sometimes it is just a question of gaining political kudos from providing regional public goods. When objectives are mainly political, you tend to get expensive projects that make little commercial sense. There was little direct strategic benefit to putting men on the moon for example, but billions was spent in the space race for the sake of prestige. Globally, there is a colossal “infrastructure gap,” with infrastructure needs vastly outstripping spending. But we exist in a world where there is an abundance of capital, sloshing around seeking returns. For big government wallets, the large numbers and long time frames involved in infrastructure projects matter less, but viability should still be a concern if economic logic is the driving force behind the infrastructure race. But often, it isn’t. In his new book on the Belt and Road, analyst Tom Miller says that, off the record, Chinese officials admit that they expect to lose 30 percent of their investments in central Asia and up to 80 percent of their money in Pakistan. It is precisely this lack of commercial concern that raises alarm bells over Beijing’s strategic intentions. These alarm bells ring particularly loud in India, where China’s port construction is seen as an effort to encircle India with a “string of pearls,” woven throughout the Indian Ocean. India has a particular problem with the China-Pakistan Economic Corridor, which runs through the contested territory of Kashmir. Accordingly, the Indian attitude toward the Belt and Road has been lukewarm at best. Japan has made certain cooperative noises toward the initiative, but it’s clear that their stance is also more competitive than cooperative in nature. Together, Japan and India have replicated elements of their larger strategic relationship in their approach to building bridges. In the military realm, they host joint exercises; in the infrastructure world, Narendra Modi and Shinzo Abe lead something of an alternative Silk Road in the form of the Asia-Africa Growth Corridor. India is investing in Southeast Asia and Iran, but it cannot compete with Chinese capital on a serious scale, and New Delhi has its own domestic problems when it comes to building working infrastructure. The job of competing with China in Asia thus falls largely to Japan. Japan has been building infrastructure in Asia for decades, rolling out funds through financing vehicles like the ADB and the Japan International Cooperation Agency. But since Beijing’s announcement of the Belt and Road, Japan has really stepped up its efforts, with Abe trailing Xi in Asia, making similar, if slightly quieter, commitments. Japan’s main countermove to China’s new “lend and build” push was the announcement of its Partnership for Quality Infrastructure (PQI). As the name suggests, Tokyo trumpets “high quality” as the selling point of Japanese infrastructure exports, taking advantage not only of Japan’s strengths, but also the perceived quality issues of the “Made in China” brand. Tellingly, PQI was started with a $110 billion budget, a sly 10 percent higher than the initial capitaliaation of the Chinese led AIIB. High-speed rail is the main arena of direct competition between Japan and China. In 2015, Japan lost out to China in a bid to build the Jakarta to Bandung high-speed rail in Indonesia. Tokyo’s response was to scrap some of Japan’s more stringent requirements for state guarantees, a move which has prompted fears that commercial sense is being disregarded for the sake of national prestige. Jonathan Hillman, director of CSIS’s Reconnecting Asia project, tells me that healthy “competition can be good if fostered properly,” but that it also risks “a ‘race to the bottom,’ in which lower standards prevail.” In other words, Eurasia’s competing visions risk wasting resources and lowering infrastructure standards across the board. Broadly, Japan and India’s competition with the Belt and Road is motivated by a desire to resist an Asian future dominated by China. Value systems play some part in this resistance, but Japan and China’s competing visions largely differ over the question of how central a role Beijing will play in reconnecting Asia. The Association of Southeast Asian Nations (ASEAN) has its own vision for seamless connectivity between its ten member states. But ASEAN is limited by the disunity and relative size of its members, who are, to varying degrees, both reliant on Chinese money and wary of Chinese might. In the great Asian game, they must play a difficult balancing act, and whose money to accept is as much a political choice as it is about good business. The Central Asian republics are involved in a similar balancing act, this time between their Russian and Chinese neighbors. The visions of these two powers are very much at odds with each other, but they also contain a strangely cooperative element. Vladimir Putin’s grand, civilizational understanding of “Eurasianism” is embodied in the European Economic Union (EEU), which is the Russian president’s flagship project for the integration of the post-Soviet sphere. On paper, China’s growing involvement in the ex-Soviet states of Central Asia, and Xi Jinping’s own concept of “shared human destiny,” is at odds with Putin’s plans for his backyard. Indeed, when the Belt and Road was first rolled out, a Russian senior official told Carnegie academic Alexander Gabuev, that China’s initiative was “just another attempt to steal central Asia from us.” What changed? 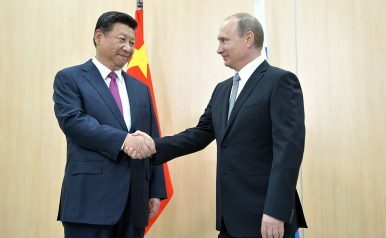 According to Gabuev, Xi and Putin share a genuine personal affinity, but more than this, Russia needs China as a friend. Relations between China and Russia have warmed considerably after Western sanctions prompted Russia to look East, with Russia making several important concessions and getting on board with the Belt and Road. It is a friendly, but pragmatic relationship, in which Putin holds the Belt and Road in a kind of awkward embrace. It is this schizophrenic mix of cooperation and competition that defines the varying visions for Eurasian connectivity. The other big players on the continent – the EU, South Korea, Turkey, and Iran – also view the Belt and Road with varying degrees of enthusiasm and caution. They all have their own infrastructure initiatives, which cooperate and compete with the Belt and Road to varying degrees. What these visions all have in common is the centrality of the Belt and Road to their responses. This is the defining factor of the new Great Game. Infrastructure building in Eurasia might be a complex international effort led by competing visions, but no vision compares in scope to that of China. Whilst China might brush up against the regional interests of Japan in Southeast Asia, Russia in Central Asia, and the EU in East Europe, only the Belt and Road boasts truly supercontinental ambition. Every country has its own vision, but only China’s plans are truly visionary. Beijing imagines a continent built by China over the course of decades, setting the stage for China to become a, if not the, great power by 2049. Therefore, competition over infrastructure will play out largely in reaction to the success of China’s own efforts to connect the continent. There are multiple players in the game, but China is the one to watch.